This is a small meadowhawk. The thorax is brown and is covered with brown hairs. On juveniles the abdomen is dark brown with a black lateral stripe on each side. On mature males it is red. Females appear in two forms. On red form females the abdomen is red. On yellow form females it is whitish-yellow. All mature individuals have a black triangular marking on each side of each abdominal segment which, taken together, form a jagged, black line. The face is yellow to brown. The inner third of the forewing is amber. The inner half of the hindwing, from the point of attachment to the wing notch (nodus) is amber. All of the wing veins are black. In males and most females, the outer portion of the amber area on the hindwing is darkened, forming a band. The outer portion of both wings is clear except for the dark stigma on the leading edge of each wing. Western meadowhawk (S. s. occidentale) has narrow black lines on the side of the thorax in the form of an irregular W. Eastern band-winged meadowhawk (S. s. semicinctum) lacks these markings. 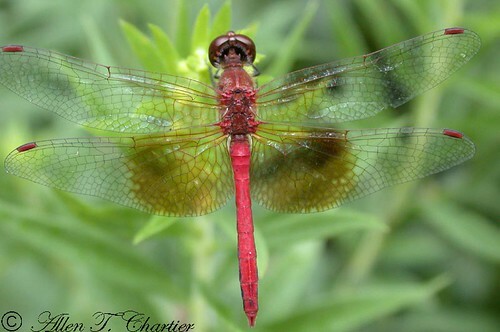 Saffron-winged meadowhawk (Sympetrum costiferum) veins within the amber wing patch are reddish or orange, not black. Eggs are laid among plants emerging from the water at the edges of ponds and in marshes while the female is still in tandem with the male. Distribution Sources: 7, 16, 18, 29. 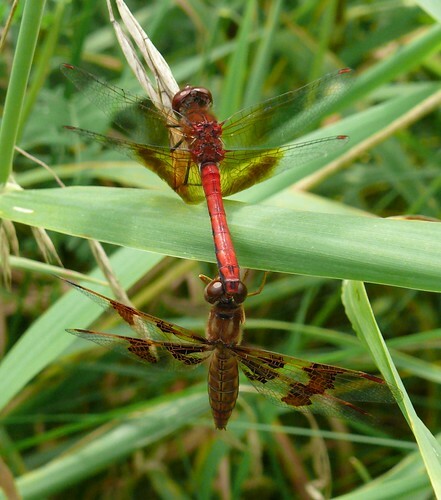 Western meadowhawk was formerly considered as a separate species, Sympetrum occidentale. A recent molecular and morphological study (Dohlen, 2007) showed that the two species are identical at two genetic loci and that the morphological characters used to distinguish them overlapped. 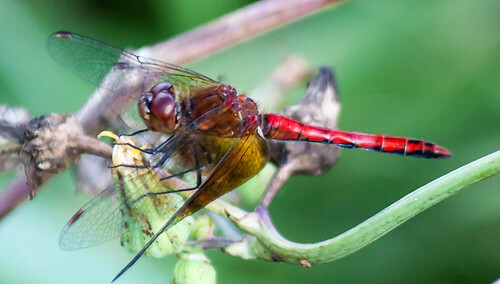 On a dragonfly, the small notch on the lead edge of each wing about halfway between the body and the tip. Band-winged Meadowhawk (Sympetrum semicinctum) at Lake Byllesby Dakota County Park near Cannon Falls, Minnesota, on September 14th, 2010. Photographed in the strong prairie wind at the Glacial Ridge NWR, Minnesota (07 July 2010). Band-winged Meadow Hawk Sympetrum semicinctum, female, eating an insect and dash off to catch anotehr insect and gulp it up is short time. Photographed at the Turtle River State Park, North Dakota (16 August 2010). Western Meadowhawk dragonfly (presumably) filmed at Queen Elizabeth Park in Vancouver, British Columbia - summer 2010.